Not so much a recipe - how can it truly be a recipe with only one ingredient - as a really great and simple side dish. I wasn't going to blog this at all, until I put them on the table alongside the Cajun Chicken in the previous post and my other half exclaimed that they were the best potatoes ever. So I thought I would share. 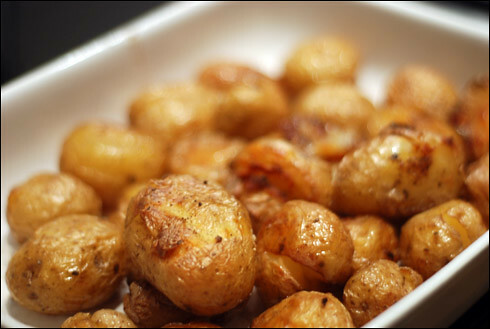 Boil the new potatoes for 15-20 minutes, until cooked and soft when you test them with a knife. Drain and leave to cool. Put the oven on at 200°C and bring to temperature. Meanwhile, when the potatoes are cool enough to handle, gently squash them so they crack but don't break (there will be some casualties, but it doesn't matter). Lay them in a single layer on a baking tray, drizzle with olive oil, chop up the butter and distribute among the potatoes and then sprinkle with salt and pepper. Roast for 35-45 minutes, turning occasionally. The skins should be cracked and golden like you see in the picture above, and the flesh melt in the mouth soft and flavoursome. This is also really lovely if you roast them with a few extra sprigs of rosemary for flavour.